Thornburg, Virginia (September 30, 2018) – It was shaping up to be a Super Cup Stock Car Series battle for the ages, but in the end, there was a new face to Dominion Raceway’s victory lane that was celebrating and a familiar winner on the sidelines. 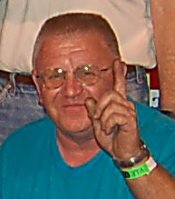 Bob Schacht, coming in undefeated at the 4/10-mile facility, set a new series track record for the Duels at Dominion presented by Racing Radios with a best lap time of 15.801 seconds. 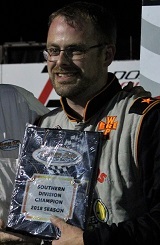 The five bonus points that came with the Pole Award extended the Mooresville, North Carolina driver’s advantage in the race for the Southern Division championship to 10 over Ben Ebeling. Ebeling; however, was poised throughout the afternoon to stay right with or, in many cases, ahead of Schacht, leading both practice sessions and qualifying closely behind in second. 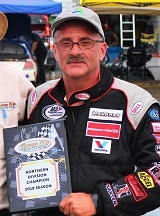 Ebeling redrew to start in the second row along with main challenger Schacht, but was moved up in the order to start alongside Kevin Kromer, who redrew the pole position for the 60-lap event, when outside front row starter Mike Potter pitted during pace laps due to an issue with his radio harness. The advance of position for the green flag allowed Ebeling to accelerate ahead, not without a brief challenge from Kromer, to gain five points back for leading in the early going. Schacht was on a mission though and passed Kromer and 2014 SCSCS champion JJ Pack to move into the runner-up spot before the race was a quarter way through. Schacht continued reeling in on Ebeling, consistently running faster lap times. Ebeling was trying with all his might to hang on. The Hickory, North Carolina driver stayed ahead at halfway and the next lap after, acquiring 10 more bonus points for leading at lap 30 and clinching being out front for the most laps. The point advantage was his, if he could stay in the lead. The No. 75 Engineered Components / PODS / Bob Schacht Motorsports Chevrolet was right on the back bumper of the No. 44 Startown Carpet and Flooring / SwannysAutoSales.net / Battery Specialists / Potter Racing Ford the entire way around the speedway. Then, suddenly coming out of turn two, Schacht’s car diverted right and harshly made contact with the outside backstretch wall. It was an abrupt end to a successful season for the 2018 SCSCS overall champion. 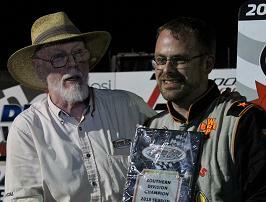 Ebeling went unchallenged the rest of the way to grab his first win at Dominion and Southern Division honors for the second straight year. For Schacht, it was a tough pill to swallow for concluding the year in such a way, but he was in decent spirits after climbing out of his second destroyed racecar of the season under his own power. “I’m betting I ran over something because it just happened so quick,” Schacht evaluated following the first race of the night. “It didn’t give me any notice at all like it was going down or getting soft or anything like that. I was coming off of two and it just popped. I’ve been super careful with my camber and stuff like that so I must have run over something. That’s the only thing I can think of. Although the standings had been settled for 2018, remaining drivers were given one more chance to take home some hardware before the night was over. A second 60-lap feature for bragging rights and one other special accolade saw top five finishers from the first race, Brent Nelson and Stephen Cox, start from the front row. Pack rallied from two spins in the earlier race to finish runner-up, but a failing truck arm resulted in the Midland, Virginia driver electing to start from the rear and pulled his No. 90 IceBoxx Customs / JP Racing Chevrolet to the pits only a few laps in. 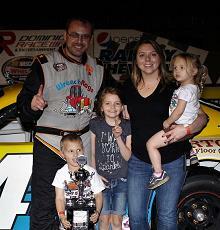 Nelson, a three-time winner in 2018, ran all night on the same four American Racer tires he competed with two weeks prior at Jennerstown Speedway on his No. 80 Royal Purple / Airtek Inc. / Steam Turbine Services / Precision Auto Collision / Atkinson Welding Chevrolet and jumped out to an impressive advantage in the early going. Approaching steadily once more was Ebeling, who finally found his way by for the lead coming out of turn four to complete lap 25. The only caution of the race for a spin by series relative newcomer, Hayden Brothers, gave Kromer’s No. 77 Lehigh Valley Cancer Institute / Mission R.A.C.E.R. / Warren Pallet / K2 Motorsports Toyota one more shot. Kromer ran right on Ebeling’s tail for several circuits, at times peeking his nose underneath entering the corners, but Ebeling prevailed in the end to sweep the night. A part-time but incredible season, filled with four victories and not one finish worse than third, was a testament to the hard work that takes place at the shop before the team is even on their way to the track. Kromer’s second place result was his best effort of the year in a car that the team purchased just prior to the September Jennerstown event. A vast majority of competitors wound up in one piece as they look ahead to 2019, in which a couple return trips to Dominion are expected. Ebeling additionally remarked his hopes for chasing the overall championship if sufficient support can be found, and Nelson registered a pair of podium finishes leading into what is sure to be another full-time run for the title that has annually eluded him. There was one final piece of hardware that had to be handed out before the night came to an end. 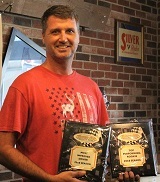 Extreme Awards and Personalization produced a custom trophy to recognize the top finishing driver who has not previously won a SCSCS event. The recognition appeared to be in the bag for Freeport, New York’s Ron Langdon after running solidly within the top five throughout the entire distance. 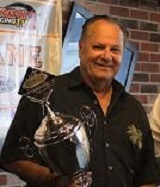 Nevertheless, coming on strong late in the going was veteran Mike Potter. The Johnson City, Tennessee driver maneuvered within a car length of the No. 17 National Appliance / Langdon’s Automotive Chevrolet, but it was not quite enough by the time the final checkered flag of the year fell. It was a stellar boost received going into 2019, almost exactly a year after making major impact with the turn four wall at the Thornburg, Virginia track. 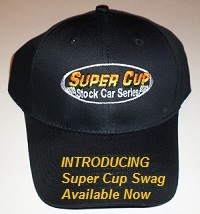 The 2018 Super Cup Stock Car Series season witnessed a number of marks that were set, showcasing the level and variety of competition that was displayed. Although the five different winners throughout the year was not a series high, the representation included drivers born in four different decades. Among the most total drivers to ever appear in at least one race in one season, more than 90 percent finished in the top 10 at least once. Perhaps the most significant record broken was the number of different top five finishers. 23 drivers accomplished the feat, a dozen of them for the first time in their SCSCS career, beating the previous high of 17 set in 2016. Multiple of the 2018 races, including both Duels at Dominion presented by Racing Radios were filmed by the Sopwith Motorsports Television Productions crew to be aired nationally on MAVTV. 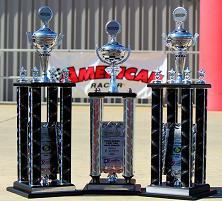 Please visit mavtv.com for full listings of upcoming televised coverage. 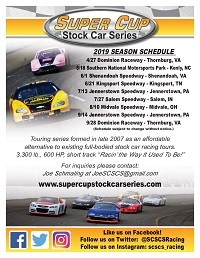 In addition, for news and developments over the off-season heading into 2019 please be sure to consult the official series web site at www.supercupstockcarseries.com and Facebook or Twitter accounts for more information regarding all that is being planned.